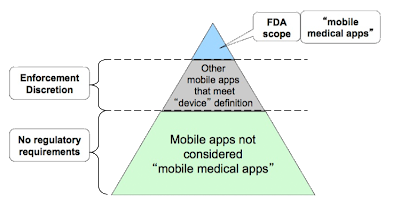 Perhaps 27% of the 229 dermatology-related mobile applications (apps) that are available today may be subject to FDA regulation despite the agency’s "enforcement discretion" safe harbor, which exempts most mobile apps that "pose minimal risk to consumers." A study by Ann Chang Brewer, M.D., of the University of Arizona, Phoenix, and colleagues, published today in JAMA Dermatology ((JAMA Dermatol. Published online September 25, 2013. doi:10.1001/jamadermatol.2013.5517), identified 229 dermatology-related apps in several categories, including: general dermatology reference (61), self-surveillance/diagnosis aids (41), disease guides (39), educational aids (20) and sunscreen/UV (ultraviolet light) recommendations (19). Of the 229 apps, more than half were free. “Applications included in the calculator category provided quick calculations for medication dosing, laser fluence levels, or dermatology- related indexes, such as the Psoriasis Area Severity Index” (e.g., see “FDA Issues Long-Awaited Guidance - for Mobile Medical Apps. Janssen, Look Out!”). Considering the potential for harm, IMHO, the dermatology apps highlighted here should be elevated to the apex of the FDA’s mobile app regulatory scope triangle depicted above.